It kind of feels like déjà vu, doesn’t it? Wasn’t it just a year ago that the Yankees, as well as Yankees fans, were gearing up for the game of their lives? In fact, the 2017 episode of this saga featuring the Yankees in the storied, one-game, Wild Card play-off, took place on October 3rd of last year. So, yes, it was quite literally one year ago to the day that anxious Yankees fans were readying themselves for do-or-die time. But, lest we forget, the 2017 Wild Card game wasn’t the premiere episode of this saga. While fans try to forget 2015 -- the episode in which Dallas Keuchel came out to the hill virtually un-hittable, and Masahiro Tanaka just didn’t have his best stuff -- the Yankees still appeared in this very same game. 2018 marks the third time in four seasons that the Yankees made the postseason, but couldn’t win the Eastern Division and had to face the one-game, winner takes all, play-off. While it’s better than the alternative of not making the playoffs at all, October would be a lot less stressful (at least initially) if the Yankees, their coaching staff and their fans could avoid the A.L. Wild Card game. Yet, in “Groundhog Day” style, there they are. Again. It is often said by baseball experts and commentators that solid pitching beats solid hitting, every time. And while the Yankees have developed both a few dependable starting pitchers, as well as an ever-changing -- but ultimately and overall reliable -- bullpen, their offense is still stronger than their pitching (especially considering they just passed the previous home run record for a single season). When taking an honest look at the 2018 Yankees’ starting rotation, collectively, it gave inconsistent showings, and changed personnel. J.A. Happ and Lance Lynn were acquired around the trade deadline. Sonny Gray was demoted to the bullpen. C.C. Sabathia is a longtime legend; however, he’s showing his age -- what with outings of 2.1 and 3.1 IP becoming more frequent, he understandably can’t pitch deep into games the way in which he once could. And what’s more, he’s not looking at retirement for 2019. 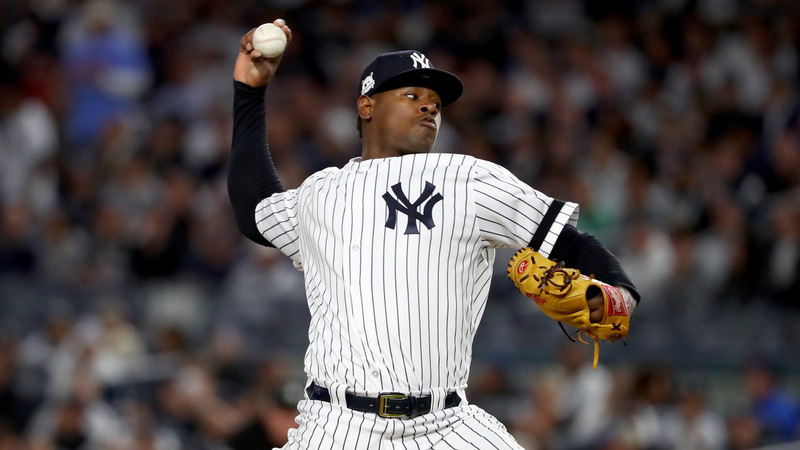 The two starting pitchers the Yankees came to expect the most production out of in 2018, Luis Severino and Tanaka, showed signs of brilliance. They also showed signs of inconsistency. And maybe not too coincidentally, they each started a previous Yankees Wild Card game appearance. Lest we forget, neither of them fared well. In continuing to look back at the two previous Yankees appearances in the A.L. Wild Card game, it’s understandable why Tanaka and Severino were the choices. In 2015, Severino was a rookie. Nathan Eovaldi had a regular season ERA of 4.20. Michael Pineda would always have that one inning in which he’d fall apart. Severino was the obvious choice in 2017, seeing as then-newcomer Gray was 4-7 on the season, Pineda’s ERA stood at 4.39 (and he was also injured) , Tanaka’s was even worse at 4.74 and Jordan Montgomery was a bit short on experience. The moral of the story? Whether it’s the Wild Card do-or-die game or the regular season, Severino and Tanaka cannot be the only answers to the starting pitching question, and hopefully, Happ continues to contribute even more to that answer than he already has. It’s highly possible that both Severino and Tanaka are burned out, a state of being that is bound to make them ineffective pitchers. File that one away under “Hard to Swallow Pills.” But it’s true: while not the case in the 2015 episode of the Yankees and the A.L. Wild Card Game, the 2017 Red Sox finished 1st in the A.L. East, the same as their 2018 counterparts. They finished the 2017 regular season with a record of 93-69, while the Yankees weren’t horribly far behind at 91-71, but it just wasn’t enough. And, if we look at this year’s records, the Yankees went 100-62, which certainly seems enough to win the division, even based on 2017 standards. Even based on 2015 standards, in which the Toronto Blue Jays won the A.L. East with a record of 93-69. And yet, the Red Sox went 108-54 on the 2018 season. In what baseball universe is 100 wins not enough to win a division title? A universe in which the Red Sox really are just that good, as the race to win the division title still wasn’t even close. If the Houston Astros were part of the A.L. East in 2018, they wouldn’t have won the division title either, with a record of 103-59. To put this concept in even greater perspective: if the Yankees were part of the A.L. Central in 2018, they would have won the division title by a long shot -- the division-winning Cleveland Indians clinched the Central Division with a record of 91-71, and they far and away beat the number-two team, the 78-84 Minnesota Twins. 2018 wasn’t the first season out of the three seasons being discussed here that the Yankees sent a number of players to the D.L., and that’s bound to have an impact on, for one, playing better or worse than the Red Sox. In 2015, the Yankees sent Tanaka, Jacoby Ellsbury, Carlos Beltran, Pineda and Sabathia to the D.L. The 2017 Yankees D.L. saw Gary Sánchez, Didi Gregorius, Greg Bird, Tyler Austin, Adam Warren, Matt Holliday, Starlin Castro, Pineda, Tanaka, Clint Frazier and Sabathia. 2018… well, we won’t get into that. However, while 2018 remains a standout year for Yankees on the D.L. because of the number of offensive players taking up D.L. spots simultaneously or overlapping with each other, the numbers in 2015 and 2017 weren’t good, either. Therefore, a conclusion can be made that if so many Yankees weren’t injured, or rehabbing injuries, in all three instances, the road to the division title would have been an easier one. Regardless of the past, and Yankees’ fans frustrations and stress surrounding a return to the A.L. Wild Card game, it’s once again unavoidable and the Yankees have to play the game whether they want to or not. The good news about the past? The Yankees have done this before and emerged victorious. 2015 was a heartbreaking baptism by fire, but nonetheless, a learning experience. 2017 was far from smooth sailing, especially in that first inning, but it was a storied fight to the finish, and to victory. A few members of the 2015 team are still here in 2018, and at least 15 regular players from 2017 will be appearing in Wednesday’s game. The Yankees have experience on their collective side, and hopefully, the third time will be the charm -- meaning that not only will they win, but, they will win without a great deal of struggle.